The property features a beautiful garden with pools and beach restaurants. It is a 122 sqm apartment with a sheltered terrace, 2 bedrooms and 2 bathrooms, sea view and a few steps to the beach, luxurious standards, fully-equipped kitchen with dishwasher, washmachine and dryer. Linen, towels and cleaning services are included. Golf and sunbathing year around. There are hundreds of activities to choose from. The area: Estepona, Marbella and the famous Puerto Banus (playground for the rich and famous) are close at hand with an abundance of restaurants and bars to suit every taste. Dominion Beach has a lovely beach. Benahavis is 7 km away and is a tiny mountain village with approximately 28 restaurants and bars and a craftman center. Further a field you will find Gibraltar for cheap duty-free shopping. Istan for its scenery, the lake and the mountains. Granada for the Alhambra Palace and architecture. Jerez for the sherry tasting. Nerja for the largest natural caves in Europe. Seville for real flamenco. Casares, a picturesque mountain village. Nous avons passe une semaine en famille debut mai 2018. Passe un petit coup de chaud le matin avant notre arrivee, homecare ne trouvant pas trace de notre reservation, nous avons passe une semaine exceptionnelle de soleil et de repos. La mer se trouve a 80 metres de la terrasse avec une vue plongeante depuis le salon. Petit jardin tres agreable avec de grands palmiers. Piscine commune a 300m, avec petit bassin pour les plus jeunes. L appartement est spacieux et bien equipe mais la decoration laisse plus qu'a desirer (style annees 90 pas revisite depuis) ce qui n'est pas bien grave vu qu'a Marbella on vit dehors ! Lovely to have you here in one of the best apartments on the cost. Costa del Sol has the best weather in Europe all year around. We welcome all who wants to enjoy the Spanish lifestyle with sun, beaches and sports. For golfers we have 40 golf courses within 30 minutes. For those that want to do excursions in Andalucia we have maps and driving instructions. Children have great fun in our safe garden with 24/7 security. You stay right on the beach with nothing between you and the Med. 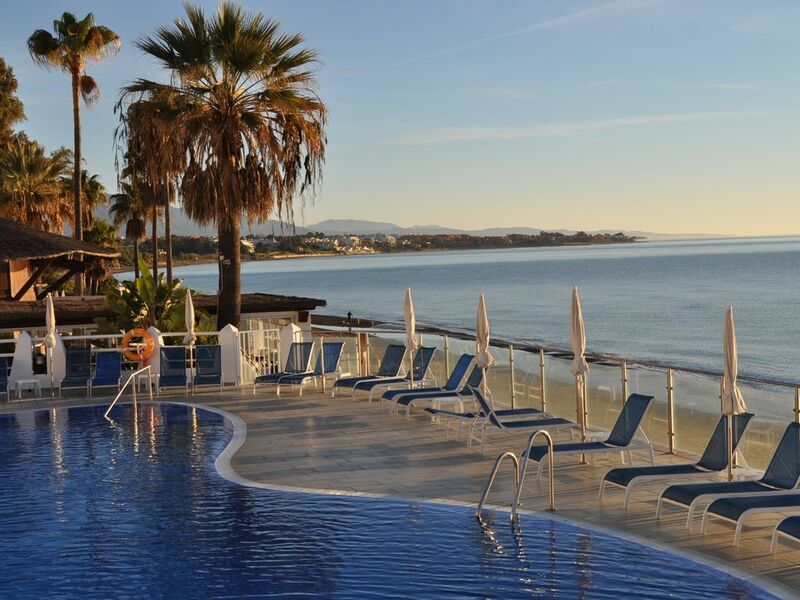 An apartment with luxury and all you need with full service from Homecare Estepona. This 2,5 bedroom have everything you wish. Direct on the beach. Everything clean in the apartment and well equiped. You have space for the whole family. Excellent service from Homecare. Two pools and access direct to the beach. Dominion Beach has its own beach restaurant. This is one of the most popular apartments in DB and has a quiet location. Das großzügige Apartment war gut ausgestattet und ließ keine Wünsche offen. Es sind keine Schritte zum Meer bzw. den strandseitig gelegenen Pools. Im Gartenbereich befindet sich ein weiteres Schwimmbecken. Trotz Hauptreisezeit war die Anlage nicht überfüllt. Besonders hervorgehoben sei der problemlose Kontakt mit dem Homecare, der jederzeit mit kompetentem Rat zur Verfügung steht. Wunderschöne ruhige Anlage mit direktem Strandzugang. Bestens ausgestattetes, gepflegtes Feriendomizil zum Relaxen und Geniessen. Mietauto empfehlenswert. near the famous Purto Banus. Las Brisas, Santa Clara, Alcadeisa, Almenara, Monte Mayor first quality clubs. Aloha, El Paraiso, Rio Real, La Quinta, Guadalmina, Los Naranjos, Santa Maria, Cabopino, Marbella, Estepona are all good quality clubs. All within 45 minutes ride.